I am not a classically-trained Pastry Chef. I am a classically-trained Chef. I never wanted to be a Pastry Chef and work with nothing but butter and sugar and chocolate all day. I wanted to get my arms burned by the oven, work on the line, feel the dinner rush, make a billion salads and sear steaks to perfection, all while making that just-right beurre blanc to go with that fish for table 9. I wanted to be a Chef, and that's what I signed up for when I went to school. I am not a classically-trained Pastry Chef, so when I get something right that's difficult for me to get right because I didn't have that pastry fundamental block...I celebrate. 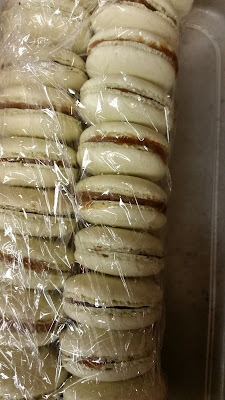 I can think of few things that are more finicky than a macaron, that elusive and heavenly "cookie" of epic skill level. There are so many things that can go wrong so it's hard to land on how you can get it right, but I think I've done it. I think I've gotten my method down, and if I can help you get yours down, I am more than pleased to do it. Preheat your oven to 300 degrees F, and turn it to high fan. 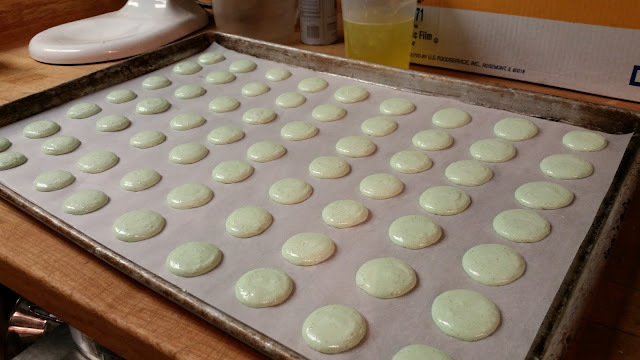 If you do not have a convection oven, I've found that if you preheat your oven to 350 and then immediately drop the temperature to 300 when the macarons go in the oven, it works quite well. Set yourself up a pot of simmering water, too, that will serve as a sort of double boiler for your eggs. Whisk/sift together the powdered sugar, salt, and almond meal. With a spatula, stir in the 92 grams of egg whites with the dyes. I used about 3 parts yellow and one part green, just to get the color I wanted...but you can play around. Like I said, use a gel dye if you can at all help it, as the moisture content in this is important. You'll want this to be a nice smooth-ish paste before continuing to the next step. Combine your granulated sugar and the 110 grams of egg whites in the bowl of a standing mixer, and set your bowl over that simmering pot of water. Whisk to combine, and then start whipping by hand while the water simmers. You want the egg whites to warm up enough to sort of dissolve the sugar easily and be warm to the touch. You'll want the egg whites to be shiny, too, before you move them from the double boiler to the standing mixer...and this can take anywhere from 5 to 10 minutes. Be patient. Pop your mixture into a piping bag. You can fit it with a medium-sized round tip, or you can simply have a plastic, disposable piping bag that you've cut the tip out of. I chose the latter, because it's easier to just pitch than fish for a meringue-y tip out of the garbage if you toss the bag on accident. If you're not quite the best with a piping bag or uniform cookies, yet, don't be ashamed to break out a pencil and trace uniform circles on your parchment paper for you to fill. And, yes, you'll want to use parchment paper...or a silicone mat, if you have it. Don't bake this straight onto the pan...it'll get sticky. They're not 100% perfect, but they're generally the same size and shape! The resting part is crucial, but will vary in time depending on how humid it is where you are. Humidity is such a factor with these stupid things that I won't even bother if it's even a possibly rainy day. The idea of the resting, though, is to allow the cookie to form a sort of "shell" that will stay still when it's baked. The shell should not be sticky when lightly touched with a finger; this takes me anywhere from 5 to 30 minutes. Be patient. Pop the cookies in your oven and bake for precisely 8 minutes at either 300 high fan or started at 350 and then immediately turned down to 300 if working with a conventional oven. Once baked, you'll be able to assess how many made it and how many did not. The cookies don't have "feet"
I'm missing a lot of things, but these are the problems and solutions found this far in my journey. Make sure you let the cookies cool completely before filling with your favorite apple butter. You can buy this stuff at the grocery store, or make your own. There's nothing wrong with a convenience product here and there, however, so don't be ashamed to fill these painstakingly-made cookies with a shortcut or two. As for storage, gently wrap in plastic wrap and "buffer" with crumpled up deli papers, newspaper, or even bubblewrap, if it's lasted long enough to be useful to you. 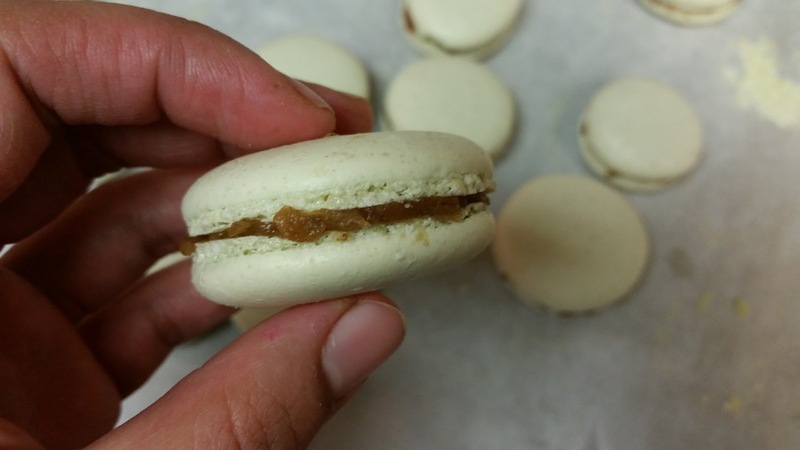 Macarons freeze absolutely perfectly, and they even will develop a nicer flavor after about a week in the freezer versus just eaten immediately. This is called "maturation" of flavor, and is oddly important to this magical cookie, that's both crunchy and chewy. Don't be afraid to fiddle around, too, with ratios and whatnot. If this recipe isn't working for you, please seek another. If this technique isn't working for you, then please seek another. This technique and this recipe work really well for me, but it may not work for you, and I'll respect and accept that. I only ask that you are not too frustrated with your previous failures that you give up entirely on your dreams of making macarons. These macarons that I've made are not perfect, but they are successful enough to pass, and are technically correct. While they're not necessarily the prettiest things, they're still great and I'm still proud of them. I hope that you try this recipe and report back with any tips and tricks you may have discovered along the way....I'm still not convinced that mine is the perfect method, and will happily admit that.